The Ashton Virgin Sun Grown (VSG) line is blended by Carlos Fuente Jr using Dominican tobacco which has been aged 4 to 5 years. The wrapper tobacco, grown on a private estate in Ecuador, is said to heavily contribute to the flavour profile of the cigars in the line. Taken from the higher primings of the tobacco plant, the theory is that the leaf matures slowly as sunlight is filtered through the layer of cloud which commonly covers the land. The flavour of this cigar is robust and intense with heavy notes of splintered cedar, muddied bark, resinous wood and earthiness, sediment rich Turkish coffee, roasted coffee beans, the darkest chocolate, potent dried oregano, dried whole walnuts, and, a bitter chicory finish. Soapy suds form on the back palate, joined by mild floral notes. A sweetness balances the quite earthy and woody flavour journey, from first puff to last. This is a balanced and full flavoued cigar with a slightly oily touch to the lips. Spectacular. Try it with a peaty malt, such as Ardbeg 10 year old or Perpetuum. A must buy for any cigar aficionado! Full marks. 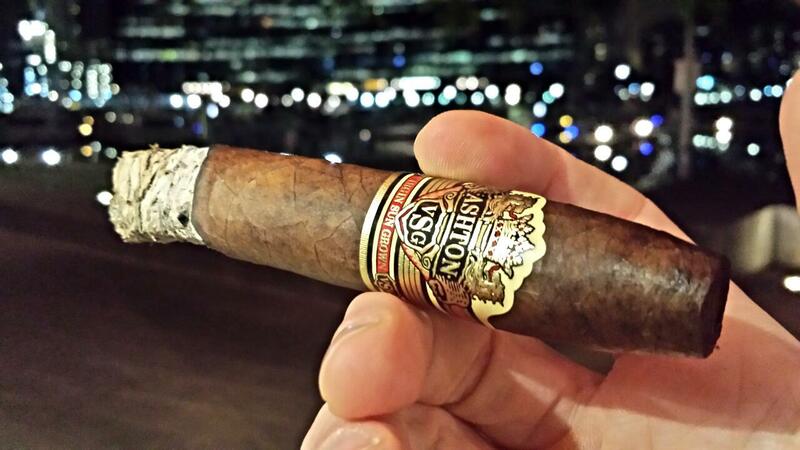 This entry was posted in Cigars and tagged ashton, cigar, dominican, smoke, sungrown, tobacco. Bookmark the permalink.